approx. 80 g/m2 up to approx. * Tested according tot SABA Analysis method unless stated otherwise. For tailored advice please contact our customer service department on telephone number +31 (0)315 65 89 99 or by email at industry@saba.nl. Apply adhesive using a rolling system. After this procedure, the bonded parts are ready to be handled in the next process step. 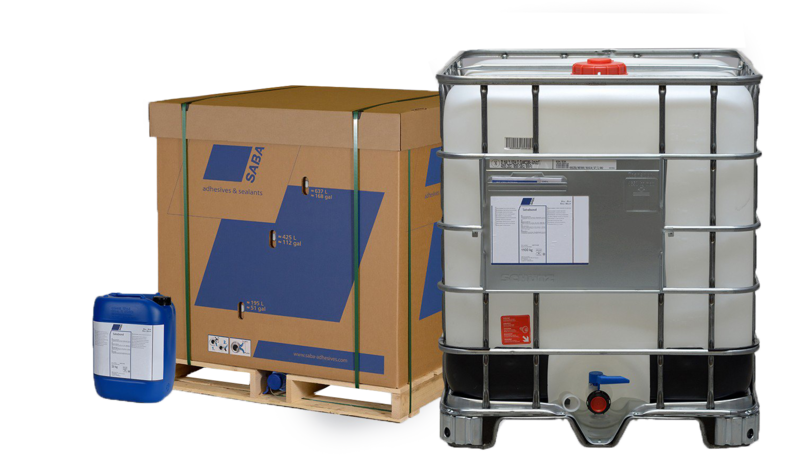 SABA attaches great value to the safe use and responsible handling of our products. For additional safety information please refer to the relevant SABA safety information sheet. Products based on Acrylate, CR, EVA, NR and PU polymers are not resistant to softening agents. SABA offers specific products for the bonding of substrates, such as synthetic leather, that contain softening agents. Please contact us for further information. Dispersion adhesives in combination with light-coloured leather can affect colourfastness. Suitability testing before use is recommended. For an optimal result the surfaces to be bonded should be clean, dry, free of grease and at application temperature. At a relative atmospheric humidity above 70% there is an increased chance of condensation, which can have a detrimental effect upon bonding.